If the Blue Ridge could write its own long and complex history, surely it would chisel the words in stone. Fortunately, it did just that. And fortunately, we have a translator in our midst. 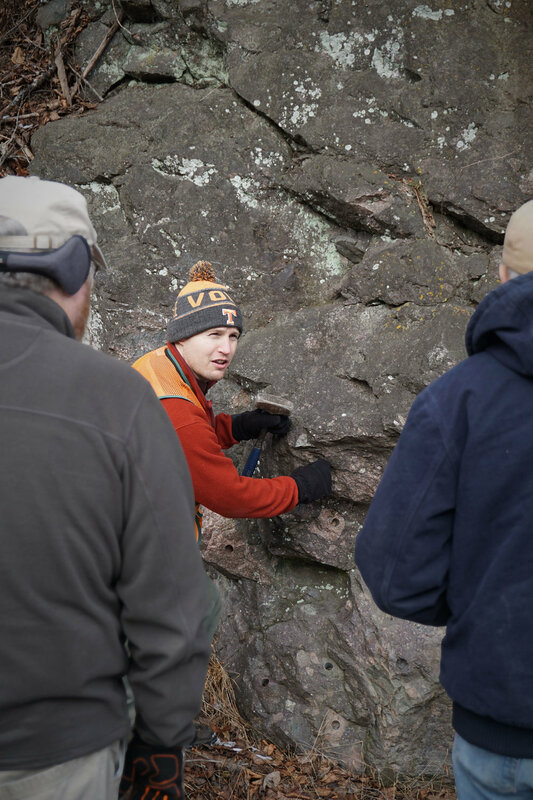 During our January 2019 Geology Expedition, USGS Geologist Dr. Arthur Merschat unraveled the story of the geologic events that left Virginia’s oldest basement rocks exposed for us to access and admire. The Blue Ridge Mountains as we see them today are a result of several major geologic events. Initially, tectonic plates drifting together over time caused continental collisions during the Grenville orogeny and produced the supercontinent Rodinia around 1 billion years ago. Around 750 million years ago, Rodinia began to break up and caused a series of lava flows and volcanic eruptions. 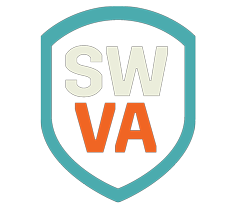 The final breakup resulted in the pulling apart of the continent and the formation of oceans, and for a time, Virginia existed as a tropical marine environment located south of the equator. 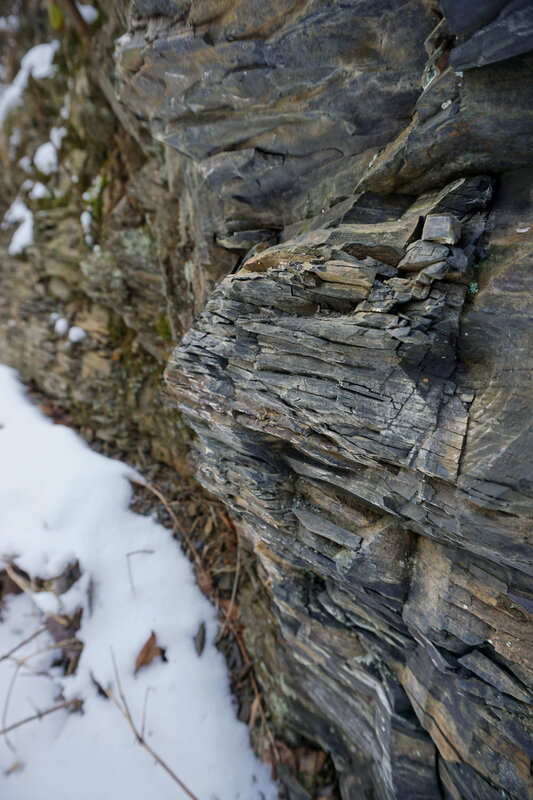 Evidence of this can be seen in the fluvial to marine sedimentary rocks of the Chilhowie Group along Whitetop Rd. However, during the Alleghenian orogeny 300 million years ago, Africa collided with us to form the supercontinent Pangea. This event thrust billion-year-old basement rocks and 750 million-year-old volcanic rocks of Mount Rogers above the layered rocks of the Valley & Ridge. It is these ancient, metamorphosed rocks that we encountered on our trip. Matrix-supported diamictite with hammer for scale. The trip began with a visit to a road cut of 750 Ma diamictite (pictured) within the Konnarock Formation. This sedimentary rock consists of clasts (pieces of rock or minerals that range from pebbles to cobbles and boulders) supported by a matrix of sand and clay and tells us that this area was once a glacial environment. Our next stop within the Konnarock Formation provided an opportunity to spot dropstones. During glacial melt, granite stones that had been carried in the ice dropped into the soft sediment (rhythmite and laminite) of the lake beds. Next, we ventured north on Whitetop Rd. 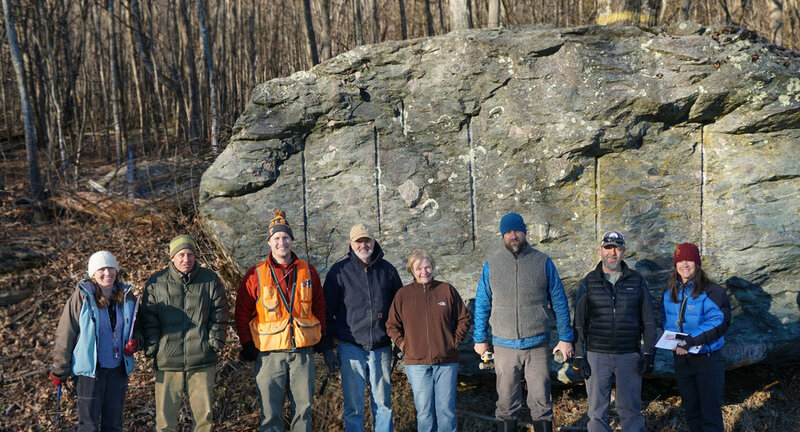 to view elements of the Unicoi Formation within the Chilhowie Group, where a 540 Ma basalt flow is easily visible within a road cut on Iron Mountain. From north to south it is possible to see the basalt flow with conglomerate, arkose, and shale below, and quartzite above. During metamorphism, vesicles - former gas bubbles within the volcanic rock (basalt) - were filled with other minerals such as potassium feldspar and calcite. These filled vesicles are referred to as amygdules (pictured). In this chunk of basalt with potassium feldspar amgydules, Dr. Arthur Merschat tests for calcite using hydrochloric acid. Black slate in the Hampton Formation. Our next stop was the Hampton Formation at Skulls Gap on Whitetop Rd. Here, an underwater landslide occurred while the black shale (formed in an anoxic environment) and sandstones were deposited, which were later metamorphosed into slate and quartzite (pictured). Heading across Whitetop Mountain and along the Stone Mountain Fault, several stops allowed us to view rocks within the Mount Rogers volcanic center, including flow-banded lava, arkose, and volcanic breccia, as well as greenstone featuring phenocrysts of plagioclase (large, conspicuous crystals of plagioclase feldspar), and more amygdules, this time filled by epidote and quartz. Next, we encountered the Buzzard Rock member, the lowest and oldest rhyolite in the Mount Rogers volcanic center at over 755 million years old. 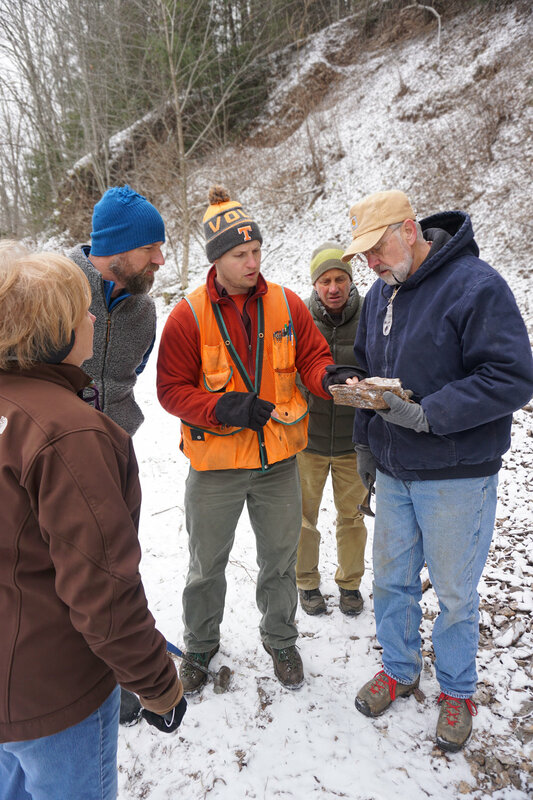 Geologist Dr. Arthur Merschat describes the greenstone at Elk Garden. Phenocrysts of plagioclase embedded in greenstone. Potassium feldspar and plagioclase phenocrysts in the Buzzard Rock rhyolite. Once we crossed over the Catface Fault into the Pond Mountain volcanic center, we encountered mylonite, a fine-grained fault rock containing muscovite which had been lineated due to shearing and flattening. Mylonite with lineated muscovite along the Catface Fault. Farther up the road, we glimpsed a peek at the 1.1 billion-year-old basement rocks within the Stone Mountain thrust sheet. 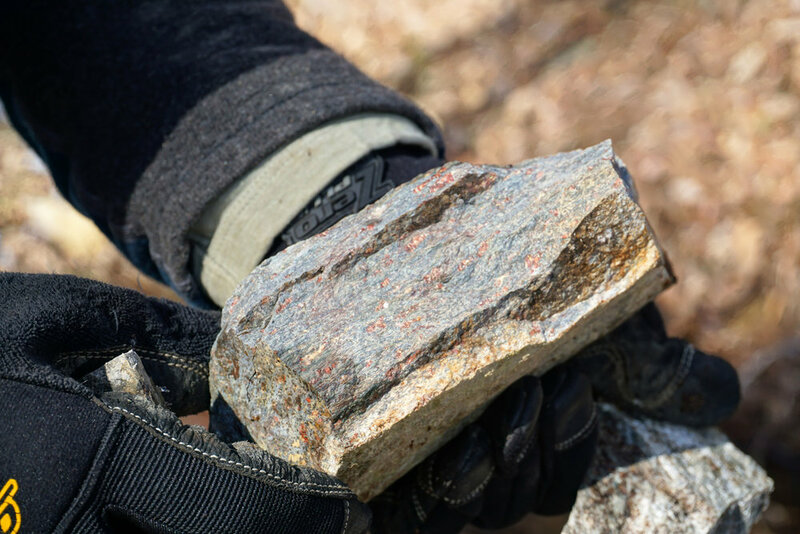 These coarse, whitish-gray and pink granite rocks contain minerals that were crystalized deep in the earth’s crust before the formation of the Blue Ridge Mountains. Our final stop at a road cut afforded us a wide view of the large clasts of rhyolite, granite, and arkose that comprise this boulder conglomerate. Beautiful! Participants admiring a road cut of boulder conglomerate. The Geology Expedition was a full-day adventure of traveling through and unraveling millions of years of the Blue Ridge’s history. And although we only encountered a fraction of what there is to see, we ultimately acquired a deeper understanding of the geologic events that created this montane region*, the very foundation of our Center. *If you are interested in learning more about the natural history of this unique region, join us for the Spring Mt. 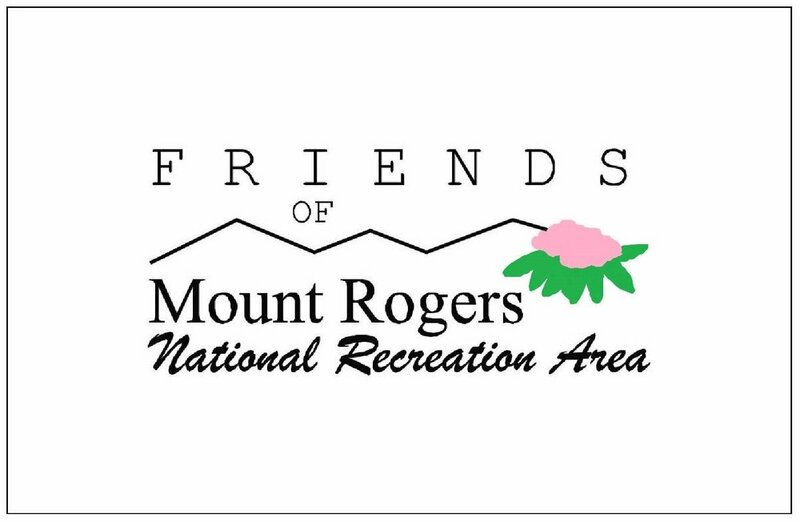 Rogers Naturalist Rally May 10-12, 2019. Arthur Merschat explaining our geological history on the USGS Geologic Map of Mt. Rogers Area (Merschat et. al., 2016). Arthur tells the story of diamictite formation. The crew discussing glacial dropstones. 540 Ma basalt with celadonite amygdules. Geological evidence of the underwater landslide within the Hampton Formation. Jay, Elaine, and Aaron observing greenstone at Elk Garden. Lisa taking advantage of a winter photo opportunity! 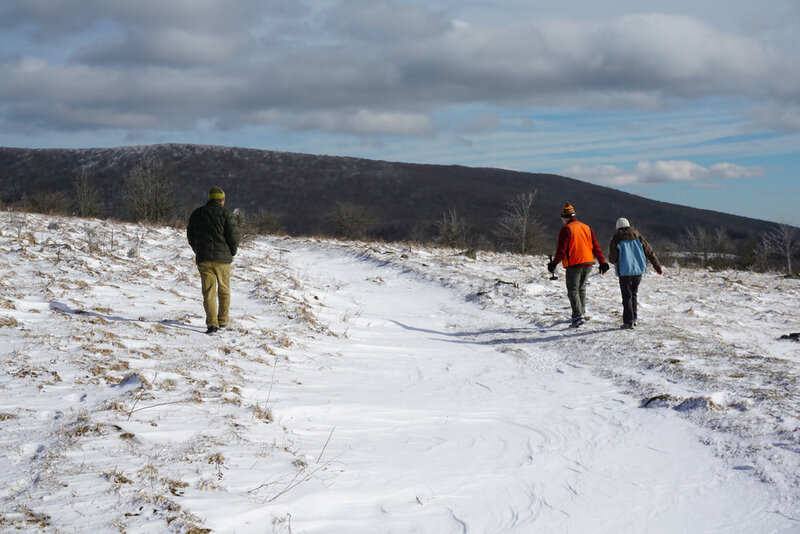 The Appalachian Trail under a blanket of drifted snow. The 2019 Geology Expedition group in front of boulder conglomerate, still smiling! 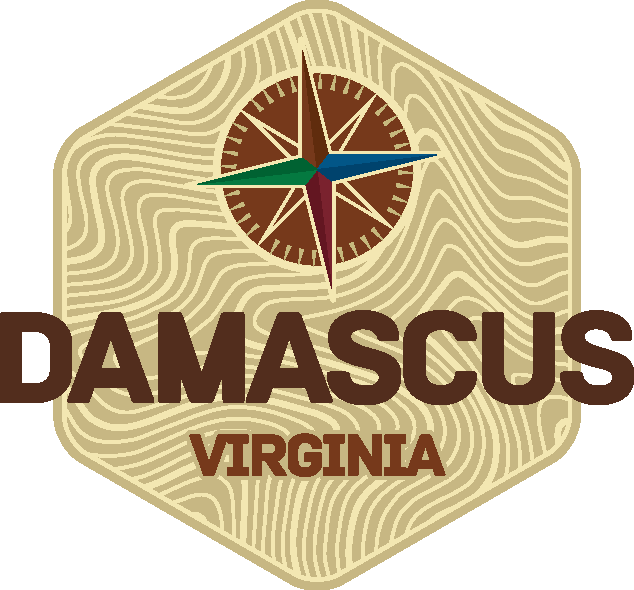 Newer PostVirginia Master Naturalist Course begins this week!